Charming three-roomed apartment in a pretty complex in a quiet area near the centre of Dimaro, with scenic views. The apartment is on the second floor and is all on one level. 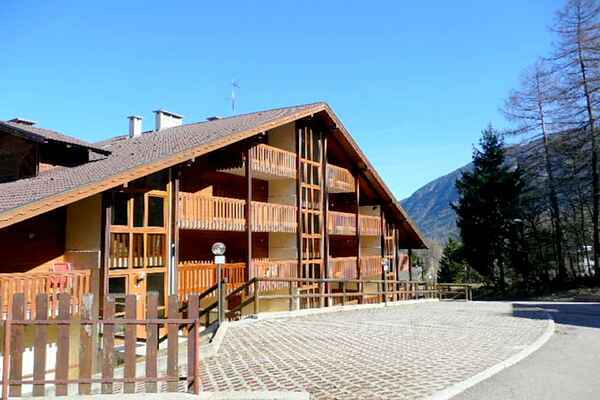 Recently refurbished, it is tastefully decorated in typical mountain style, giving it an extremely cosy and welcoming feel. The lounge opens onto a balcony with wonderful views. On the same level there is a triple room with bunk beds and a single bed, bathroom with bath, and a double room with a gorgeous wooden double bed, ensuite shower room and a private balcony. The property is located five minutes' walk from the centre of Dimaro. The convenient location means that Passo del Tonale, Madonna di Campiglio, Peio, Rabbi and the Stelvio National Park are a short drive away. The layout makes it particularly suitable for couples or families. The apartment has colour TV, dishwasher, independent heating, private parking space within the complex, and lift.